For the roasted garlic ranch: Preheat the oven to 425 degrees F.
Rub the garlic with the oil, then wrap well in foil. Roast until soft and golden, about 35 minutes. In a bowl, whisk together the buttermilk, mayonnaise and sour cream. Push the roasted garlic cloves out of their skins and onto a cutting board; sprinkle with salt. With the flat side of a chef’s knife, smash the garlic into a paste. Transfer the paste to the mayonnaise mixture and whisk vigorously to incorporate and break up any large lumps of garlic. Stir in the chives and add salt and pepper to taste. Cover and refrigerate. For the jalapeno fries: Fill a large, wide pot with 1 inch of oil and heat to 360 degrees F.
Meanwhile, whisk the buttermilk and egg together in a pie plate or shallow bowl. In a second pie plate, whisk together the flour, cornmeal, paprika and 1 1/2 teaspoons salt. Dip a large handful of the jalapeno strips into the buttermilk mixture, letting the excess drip off. Toss in the flour mixture to coat. Carefully add the strips to the oil, and fry until golden brown, 1 to 1 1/2 minutes. Repeat with the remaining strips, letting the oil come back to temperature between batches. Sprinkle the fries with salt as soon they come out of the oil. 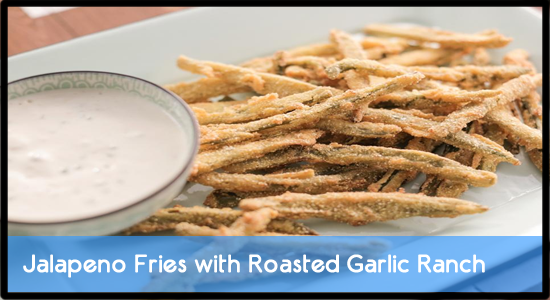 Serve the jalapeno fries with the roasted garlic ranch.